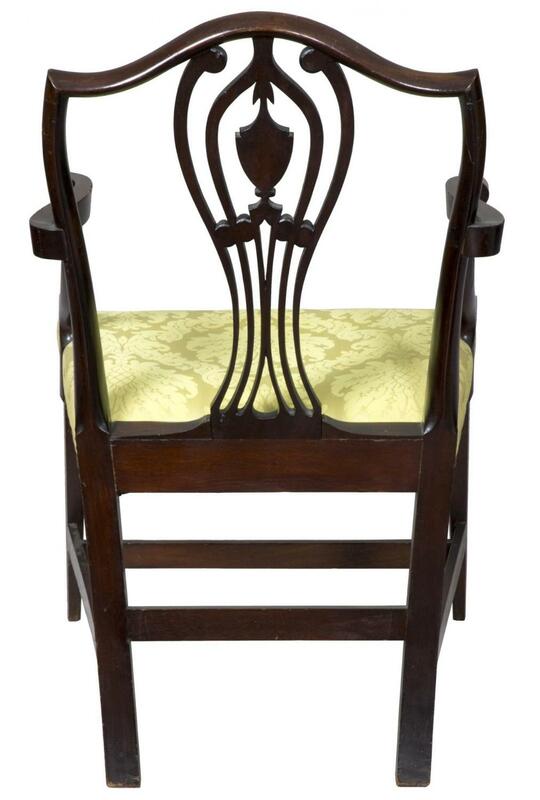 This shield-back chair of Hepplewhite design was a popular form in its time and evidences the transition from the heavier Chippendale form. 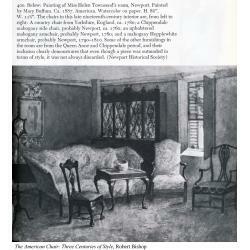 For an interesting scan showing this form in a rather Chippendale room setting, from a painting of “Mrs. 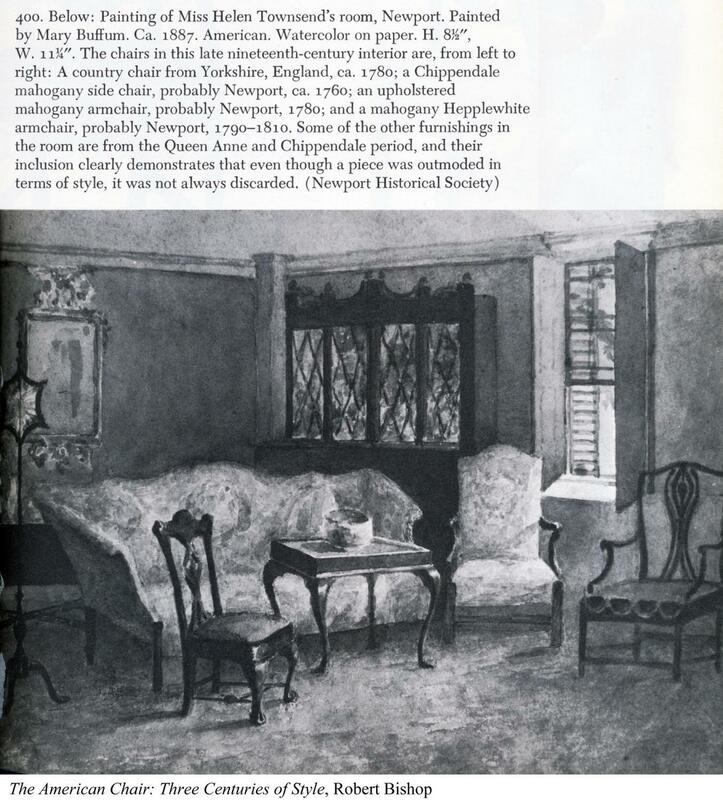 Helen Townsend’s Room, Newport, RI”, see detail for a scan from The American Chair, Three Centuries of Style, Robert Bishop. 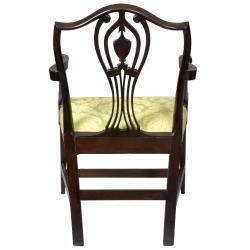 This form was used by many cabinet shops in Rhode Island and Connecticut and was made in mahogany, cherry, and birch. 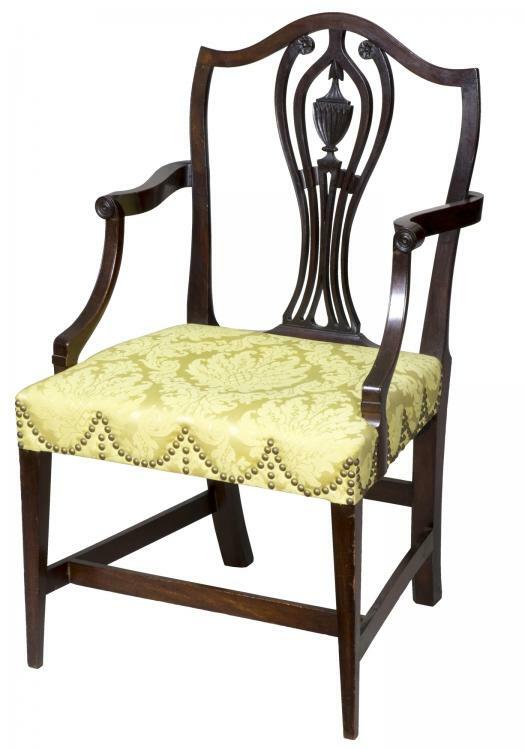 Providence is known specifically for use of mahogany, of which documented Providence examples are known, some attributed to the Robert Burrough workshop and his trademark use of seat rails which are fully mortised into the rear legs in the manner of Philadelphia makers. 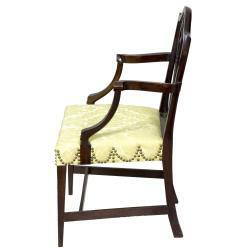 Regarding construction, although stretchers—an old design carryover—are still used for support, the front legs are now tapered, although some examples are not tapered, but square vestiges of Chippendale design. 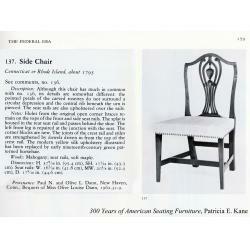 (See American Furniture: the Federal Period, Charles Montgomery Item 41.) 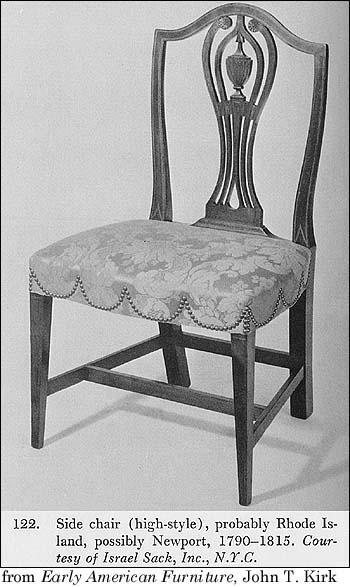 This Montgomery example shows the square leg and here he notes that those “made in Providence, have rather more graceful, taller, and thinner stiles than those we see here.” Note that this example also lacks rosettes on its splat. 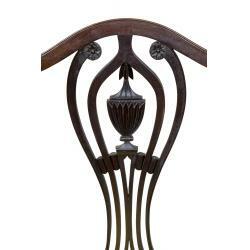 We note that while some examples have rosettes in their stile, they may also be found with a pierced opening below the urn. 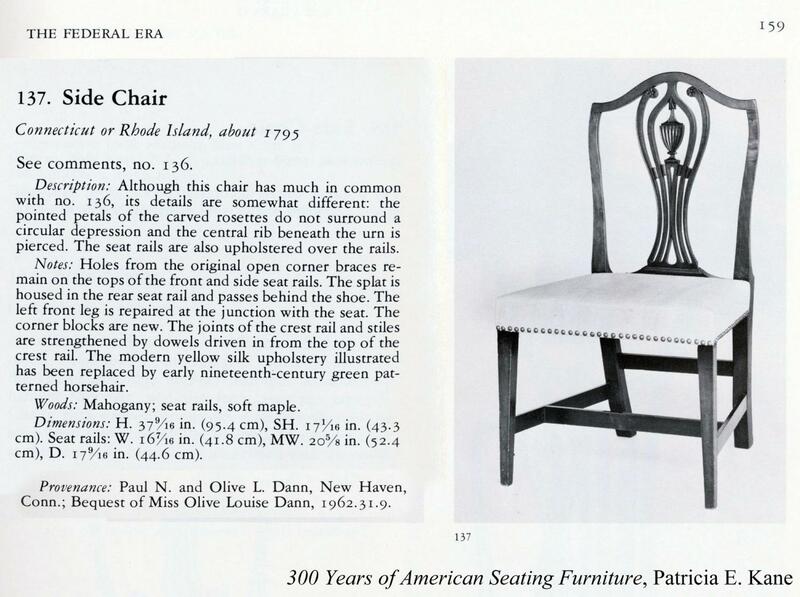 Probably the closest example to ours is illustrated as exhibit 137 of 300 Years of American Seating Furniture, Patricia Kane. 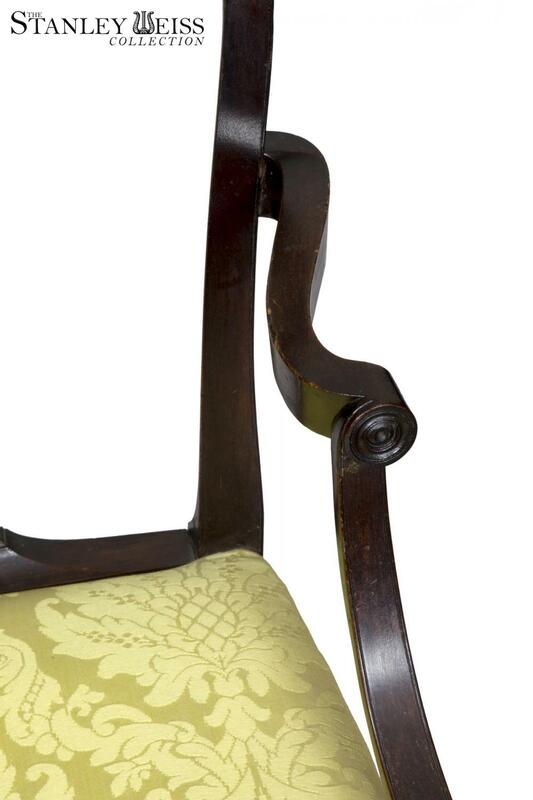 Note that this example both has finely tapered legs, rosettes, pierced splat, and more notably, a rear splat that rides very low into the seat saddle, (similar to our example), and the only example we have seen like this. 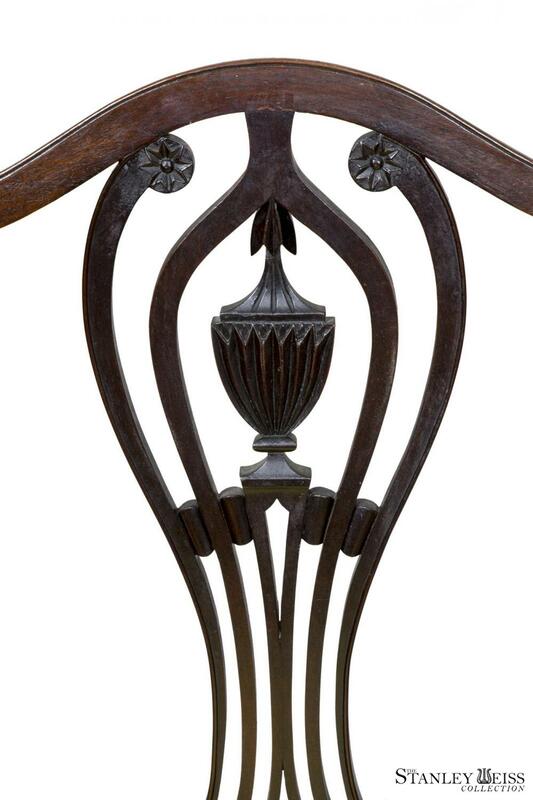 Further, Patricia Kane notes that the “pointed pedals of the carved rosettes do not surround a circular depression”, and, again, this is similar to our example. Lastly, the only other noteworthy feature is the square, unmolded arm which terminates in a drum turning, while the top surface of the arm has a clear shaped inner molding, the underside is square, unlike the arm supports, crest rail, and stiles. 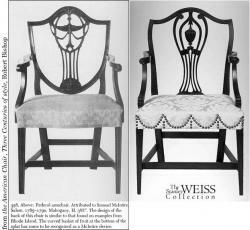 This treatment is the same as a chair illustrated in The American Chair, Three Centuries of Style, item 358, Robert Bishop. 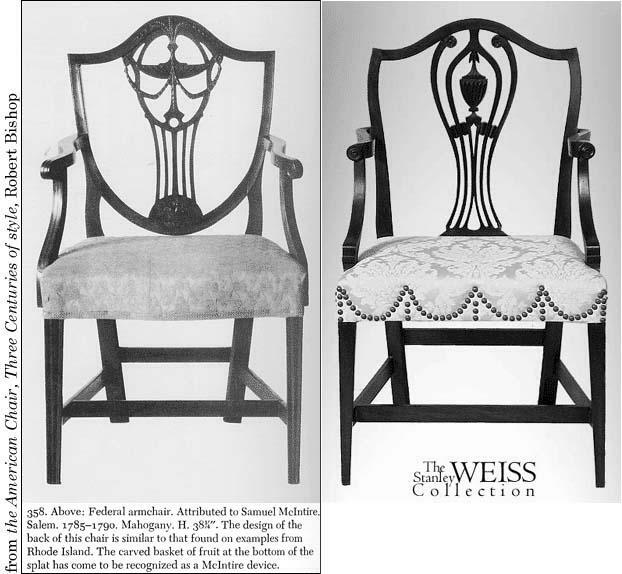 Interestingly, this chair also uses a drum turning in different position and is attributed to Samuel McIntire, Salem, although the author notes in his footnote that this design is “similar to examples from Rhode Island”. 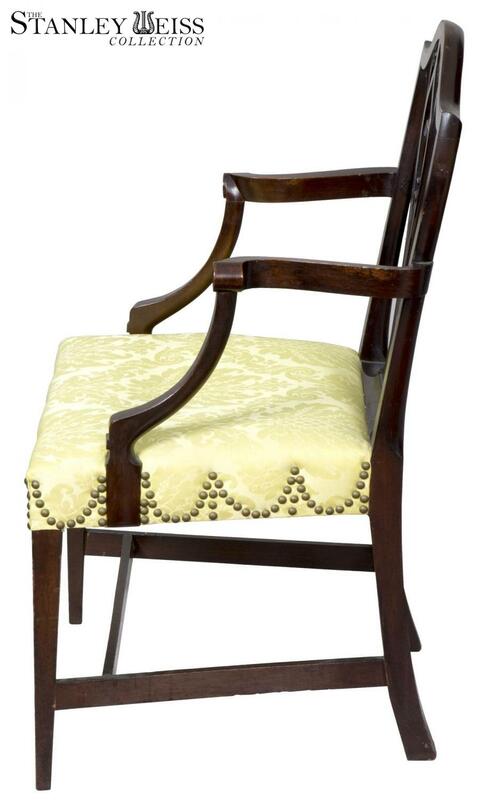 Height: 36 3/4 in. 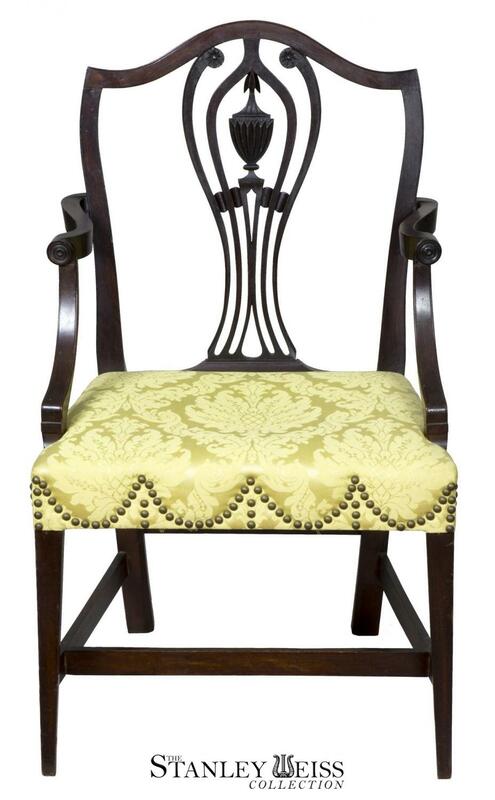 Seat Height: 17 1/2 in. 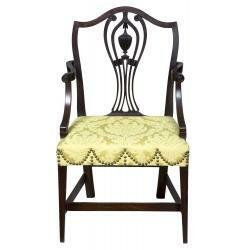 Width: 21 1/2 in. 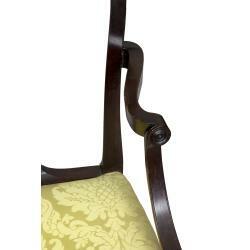 Depth: 20 3/4 in.